Anything Could Happen understand that encouraging reluctant writers is a challenge in many classrooms. We look to inspire writing by bringing children's stories and ideas to life before their very eyes! Using just their input our skilled actors use improvisation techniques to create unique, live, interactive and unforgettable performances. 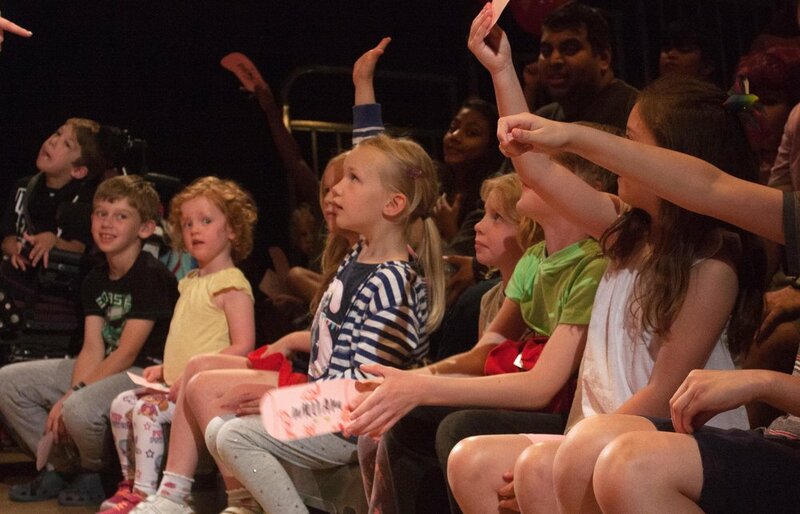 If you're a teacher, librarian, home educator or you're involved with any children's community projects get in touch to claim your free ticket to any of our shows and workshops. We believe that creative thinking is essential to modern living. Not just because it's a desired quality for any job applicant but with all the pressures and stresses of daily life we all need a creative outlet. That's why we structure our show so that everything that happens, every detail of every story, comes from the children in our audience. In our shows we nurture a safe environment so that even the most hesitant of children feel brave enough to voice their ideas. Even if they don't like raising their hand in class, even if English isn't their first language their desire to join in the fun often outweighs their insecurity. In Anything Could Happen shows we work to tell stories together. Whether it's their ideas for characters, locations and plots or making use of their performance skills kids are the stars of our shows. We love our way of working as it allows for a truly organic process to create a story that everyone in the group feels ownership of. ...START A NEW TOPIC WITH A BANG! Because our actors are so darn talented they can turn their hand to any subject and give it the wow factor you need to hook children into a new topic. You need Mayan Leaders to come to the school looking for willing sacrifices? No problem. You'd like Galileo to come to class and answer the children's questions? We got you. We firmly believe that one of the most valuable skills you can have in life is a sense of humour. It's your defence against an often unfair world, it diffuses family tension, it's what bonds you to your friends and it's what shines light into the darkness that inevitably comes with life's challenges. We never underestimate the power of a right good laugh.